When we import a chemical, do we need to make a new SDS? Where can I get SDS's in other languages such as Spanish? What language does an SDS need to be in? Where can I get information about European requirements for SDS format? How do Canadian SDS's differ from the U.S.? When chemicals are imported into the United States, the person (meaning one or more individuals, partnerships, associations, corporations, business trusts, legal representatives, or any organized group of persons) who imported the product automatically becomes the responsible party. OSHA only has jurisdiction over transactions which affect commerce within the United States. As the importer is the first point of contact within this country, the importer is therefore responsible for complying with the HCS; the HCS requires that the importer include their name on the SDS and label. We are unaware of any exemption from these responsibilities under the North American Free Trade Agreement (NAFTA). Being the "responsible party" entails important obligations. See our SDS FAQ question "As a distributor, can we change the name and address on an SDS" for more on the obligations of the "responsible party". As the "responsible party", can an importer simply substitute their name and address on a foreign-issued sheet? Yes, provided that the sheet has all of the information required by the Hazard Communication Standard. But do not simply assume that any SDS you receive has all the required information or that the information is correct! You should independently verify that the hazard information/precautions conveyed are accurate, documenting those efforts if appropriate. You may find our SDS FAQ question "Who can write an SDS" of some use. If an importer does not wish to deal with checking/verifying the sheet information, there are firms that will, for a fee, take the SDS's you have and create new ones for you. See our SDS Suppliers/Translators page for some examples (if you contact any of those firms, please let them know you were referred from their placement on our web site; their support makes this free resource possible, after all). Canada's WHMIS regulations appear to work the same way as OSHA's in requiring the importer to produce a compliant SDS if one is not available. We have no information regarding the import or export of SDS's to/from other countries, but it appears that most countries have regulations similar to the U.S. regulations. MSDS Solutions 100,000+ English, German, Chinese, Dutch, Spanish and French. This site houses over 4,500,000 SDS's! EMD Millipore 12,000+ English, French, German, Spanish, possibly more. Eastman Kodak 1,500 English, Danish, Dutch, Finnish, French, German, Italian, Norwegian, Portuguese, Turkish and more. Note: Some versions require following a link to a regional web site. E. I. du Pont de Nemours and Company 1,400+ SDS on their products. Select from approximately four dozen different languages/countries in pulldown menu and then search by product name/synonym or DuPont SDS #. 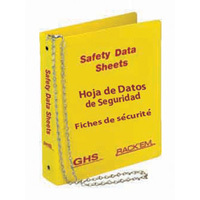 ANSI-compliant sheets in PDF format. 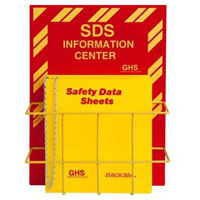 Safety Emporium carries Bilingual SDS binders, signs, labels, and more. If you only need to translate a few words, MexicanLaws.com offers a 10,000 phrase English-Spanish chemical dictionary. Automatic translation sites such as Google Language Tools and Bing Translator provide translation in a number of language pairs, but use these with caution as word-by-word translations are generally not reliable. If anyone knows of other foreign language sites or technical dictionaries, please let us know and we'll add them to our list! Languages required for labels and safety data sheets at the European Chemicals Agency (ECHA). Guidance on the compilation of safety data sheets also at ECHA. We do not have extensive information on other countries available, but if you have information to contribute, please let us know. European regulations regarding SDS's, labelling and packaging follow the Globally Harmonized System (GHS). However, the GHS is a model standard, so not all countries around the world have implemented it in the same way. For example, in the US, OSHA has no authority over the content in sections 12-15 of an SDS and therefore does not enforce those under the 2012 version of the Hazard Communication Standard, but in Europe these are enforced. Likewise, in Canada, SDS's expire after 3 years, but the US has no such requirement. Regulation (EC) 1272/2008 on classification, labelling and packaging of substances and mixtures (CLP) implemented the GHS via amendments to Annex II of REACH. The CLP was a stepwise replacement of Directives 67/548/EEC (substances) and 1999/45/EC (preparations). 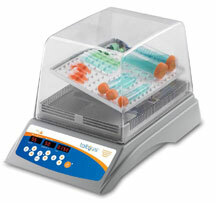 Safety Emporium has all kinds of lab equipment such as these incubating rocking shakers and more in both US and European voltages. The European Chemicals Agency maintains an up-to-date list of the legally-required harmonized classifications and labellings for substances in the EU. Simply click on the "Search for Chemicals" box to search by name, EC or CAS number or select the Advanced search for a wide variety of options. The EU's REACH regulations are creating a central registration point for chemical information as well. The ECHA document Guidance on the compilation of safety data sheets is a particularly useful resource. The now superceded directives 67/548/EEC and 99/45/EC required producers of dangerous chemicals in EC (European Community) member states to provide industrial and professional users with detailed health, safety and environmental information and advice about their products in the form of safety data sheets. Directive 91/155/EEC, as amended by Directives 93/112/EEC and 2001/58/EC, set out the requirements for the information which should be included in a safety data sheet. You may download 2001/58/EC in various languages from the European Union web site. This site also has Directive 98/24/EC which outlined employer responsibilities in detail. Environmental Software and Services has a nicely formatted section-by-section discussion of European sheets and mentions their differences with U.S. requirements. The United Kingdom's law governing SDS's (among many other items) was originally the Chemicals Hazard and Information and Packaging for Supply Regulations (CHIP), which were revoked effective June 1, 2015 after the GHS was phased in. It is unclear whether the UK will keep numerous domestic regulations in line with the rest of the EU following their June, 2016 vote to leave the European Union, but we suspect they will almost certainly need to keep their SDS regulations on par with their biggest trading partner. Stay tuned. Two other resources that may help are Chemical Safety Cards produced by the International Occupational Safety and Health Information Centre and Status of GHS Implementation By Country (which is a worldwide list, not merely the EU) at the UNECE. Be sure to check out our SDS Suppliers and Translators and Software pages; there are a few vendors on there that are based in Europe or offer services with EU compliance. In Canada, every material covered by WHMIS (Workplace Hazardous Materials Information System) must have an accompanying SDS. Canada is in the midst of phasing in its conversion to the Globally Harmonized System (GHS) through 2018. However, the GHS is model system, and the implementation varies from country to country, so a US SDS prepared according to the US's GHS regulation, HCS 2012, may not be sufficient for compliance in Canada. In general, the Canadian regulations covering SDS's tend to be a bit more specific and strict than the U.S. OHSA's. See the references in our WHMIS entry for more detailed information, information in other languages, and useful web links. One of the major differences is when an SDS must be updated. WHMIS SDS's must be updated every three years or when there is a formulation change. OSHA only requires an update when there is a change in formulation or health information (see the Compliance section of this FAQ). Another major difference is in the Hazardous Ingredients/Identity Information. The WHMIS rules of exposure tend to be much more specific and strict then OHSA. For instance, WHMIS requires the % concentrations of hazardous ingredients be disclosed on the SDS (unless exempted at the time of registration with the HMIRC). Also, there is a difference in the exposure limit and/or toxicological information. OSHA requires PEL and TLV to be listed while WHMIS requires the TLV as well as the LD50 value (NOTE: we have not double checked if these have come into alignment under the most current regulations). The rest of the sections are more or less the same (there are a few tiny differences). An ISSA Alert Sheet has some more details. Finally, note that Canadian SDS's are required to be supplied in both English and French, as these are both official languages in Canada. These can be two different sheets, or both languages can be on one sheet. For more information about Canadian SDS requirements, see OSH Answers Fact Sheets at the Canadian Centre for Occupational Health and Safety (CCOHS). September 1, 2016: OSHA and Health Canada announced an update plan to align labelling and classification requirements for hazardous workplace chemicals. The ultimate goal of this initiative is to devise a system, accepted by both countries, that allows the use of one label and one safety data sheet. We haven't done any extensive research on these, and the information here is a bit dated. Please feel free to contribute any information you might have to improve this section. Australia - Safe Work Australia has a Model Code of Practice - Preparation of Safety Data Sheets for Hazardous Chemicals available in both .docx and .pdf format. They also have a site devoted to Hazardous chemicals including Globally Harmonised System of Classification and Labelling of Chemicals (GHS). Mexico - Mexico has also transitioned to the GHS per NORMA Oficial Mexicana NOM-018-STPS-2015, Sistema para la identificación y comunicación de peligros y riesgos por sustancias químicas peligrosas en los centros de trabajo (English: Official Mexican Standard NOM-018-STPS-2015, System for the identification and communication of hazards and risks for hazardous chemical substances in the work place). The regulation took full effect October 9, 2018. We do not know of an English translation, but you can find a summary of the key points at Chemical Safety Consulting. The prior official regulation was Norma Oficial Mexicana NOM-018-STPS-2000. We are unaware of any sites that offer this entire document for free, but thanks to our friends at the Research and Special Programs Administration of the U.S. Department of Transportation, we have English translations of Appendices C and D of NOM-018 available on our web site. These are out of date but since we have them, we'll leave them there for historical purposes. ??? 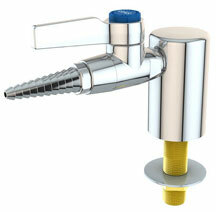 - If anyone knows of sites that detail SDS regulations in other countries please contact us. Thanks for your help! Notice: This page is copyright 1998-2019 by ILPI and was last updated Wednesday, October 31, 2018. Unauthorized duplication or posting on other web sites is expressly prohibited. Disclaimer: The information contained herein is believed to be true and accurate, however ILPI makes no guarantees concerning the veracity of any statement. Use of any information on this page is at the reader's own risk. ILPI strongly encourages the reader to consult the appropriate local, state and federal agencies concerning the matters discussed herein.